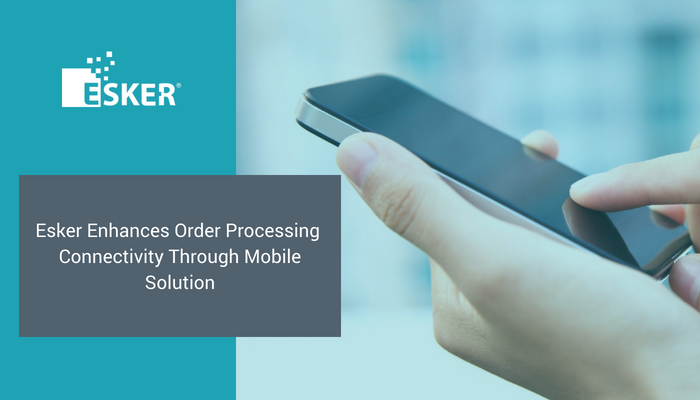 Sydney, Australia — May 14, 2018 — Esker, a worldwide leader in document process automation solutions and pioneer in cloud computing, today announced the addition of mobile ordering functionality to its Esker Anywhere mobile application. Esker Anywhere provides on-the-road accessibility for sales representatives placing orders directly on behalf of their customers, and customers themselves, and is available on both Apple® and Android™ devices. Originally launched to enhance the purchase-to-pay (P2P) cycle, the app now supports the sales order process. The new features enable mobile users to retrieve items directly from the product catalog, or to scan a barcode and automatically populate the product and lot number—saving time and increasing the accuracy of orders. Subsequent scans of the same barcode increase the quantity of the order. From there, the order can be completed through the app. Different order types can be placed, including replenishment orders, sample no-charge orders and standard orders. Sales representatives also have greater visibility into the order process through a mobile dashboard, which displays the number of orders in the queue and their status. All of this integrates seamlessly with Esker’s AI-driven document process automation solutions.